The construction industry is struggling to fill well-paid jobs, while half of recent college graduates are underemployed. Is it time to shed our national bias against getting our hands dirty? Are construction careers better than corporate carriers? The industry is growing. Economic recovery means investment in new buildings and infrastructure. Construction spending hit its highest level for four years in October, and construction jobs are predicted to be the fastest-growing up to 2020. There arent enough trained people to fill jobs. 74% construction firms are struggling to fill skilled jobs. Craft workers are in the short supply, and demand for professional workers is fierce too, with companies offering competitive salaries and raising hourly wages. The low-down: costing entire projects, such as specific costs with electricals and equipment rentals (trencher and forklift rentals, for example). On your CV: Bachelors degree in related field. Whatll get you noticed: knowledge of Building Information Modelling Software, solid math. Plus points: good mix of practical site visits, comfortable office work, and interaction with people. The low-down: Planning and budgeting construction projects, managing equipment rentals and ordering. On your CV: Bachelors degree in construction science or a related field. Whatll get you noticed: managerial experience, analytical thinking, communication skills. Plus points: growing economy and population equal a commercial and public building boom and great job prospects. Rethinking the American Dream: Is Traditional College Always the Best Option? A chilling 52% of recent graduates are unemployed or in jobs that dont require a degree. And with college tuition rates rising by around 42%, is a college education worth the cost? 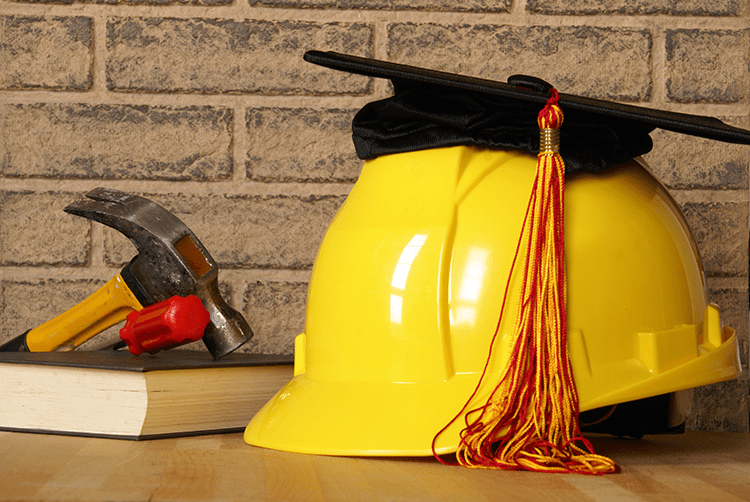 A trade school may give you more bang for your buck and better career prospects. The low-down: installation, maintenance, and repair of water pipes. On your CV: A plumbing apprenticeship – up to 5 years. Whatll get you noticed: a range of experience, adaptability, solid math. Plus points: new builds and upgrades mean plenty of work, plus boomer generation plumbers are retiring and leaving jobs open. The low-down: pouring, spreading, reinforcing and leveling foundations. On your CV: on-the-job experience or cement mason apprenticeship (3 years). Whatll get you noticed: other masonry-related qualifications. Plus points: high demand for upgrades to infrastructure means a demand for skilled cement workers.